Phoenix remains the weakest market, reporting an annual decline of 32.7%, followed by Las Vegas, down 31.7%, and San Francisco down 31.0%. 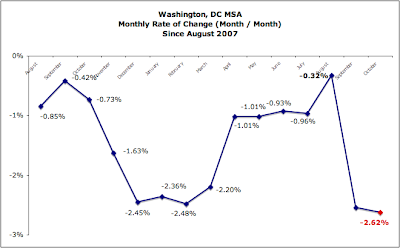 Miami, Los Angeles, and San Diego were close behind with annual declines of 29.0%, 27.9% and 26.7%, respectively. Wow! 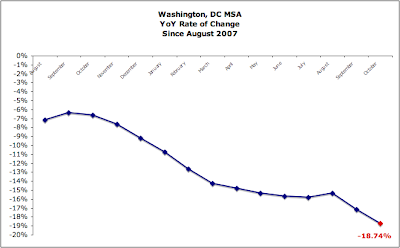 I'm interested in what the graphs for the last two months of 2008 will show. I'm also interested. Based on the posts from December, things are getting ugly in DC. But my question is, when will this affect prices, if ever? And my real question is, who are these people that put down $400K or more for a small condo? What do they do for a living? 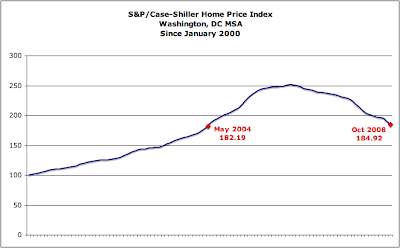 The condo bubble in DC is going to bust. Eight years on inventory at current sales rates. Several were even sold out at the top of the market. Happy condo hunting.